In 2013, Dave shocked Australia by announcing he would be giving up his radio and television jobs to go back to his roots and touring a brand new stand up show for an entire year. He and Kate Langbroek ended their Nova 100 breakfast show after 12 years with a live show at the iconic Athenaeum Theatre and soon after, he wrapped him his gig as co-host of Network Ten’s The Project after almost 5 years on the desk. 2013 also saw the final series of Before The Game, Network Ten’s iconic and much loved AFL Footy show that Dave had co-hosted since 2003. Dave toured his show Pointless to almost every corner of Australia to over 60,000 people as well as overseas to LA, Montreal, the Edinburgh Fringe and Soho Theatre in London’s West End. In 2015 Dave returned to the airwaves with long-time friend Kate Langbroek for a national drive show across KIIS and Mix FM, and Australia were stoked to have Hughesy and Kate back. He also joined the team at Channel Nine’s The Footy Show performing a mix of stand-up and his team sprays, which have become infamous in the AFL community. In 2016, Hughesy has been touring the country with his brand new stand up show Sweet and he was selected to perform at the prestigious Just for Laughs Festival in both Montreal and at the Sydney Opera House. 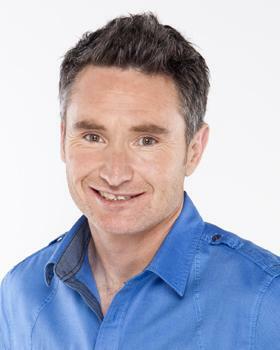 Alongside that, he continues his national drive radio show Hughesy and Kate; he regularly joins the panel on The Footy Show; and because that is obviously not enough, he hosted Australia’s Got Talent – the most successful entertainment format in the world today, for Channel 9.